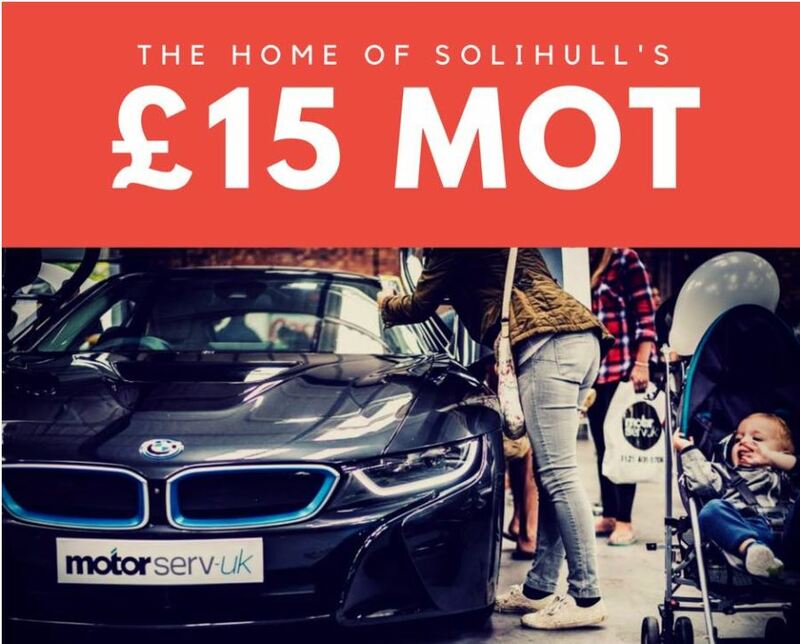 Now you can get your MOT in Solihull for just £15! - NO PASS NO FEE! Yes bring your car to us, the 'Home of the £15.00 MOT' and get it for FREE if it fails! Retests are even Free if your car does fail and you have the remedial work done by us. So what do you have to lose? Call or book online today, and we will get your MOT done as soon as possible. We will even remind you when your next MOT is due! MotorServ UK are able to provide statutory DVSA MOT tests on class 4 Vehicles. Transparent charges and repair descriptions. If your car needs repairs, you'll receive a free re-test after repairs have been completed onsite. Courtesy Cars are available for pre-booked work. Collect & Delivery service also available for all Service and Repair works. You can use our air-conditioned waiting room (complete with WiFi and FREE refreshments) during your MOT. We are an approved test centre and have facilities in-house. Our experienced MOT Testers will carry out your test efficiently and speedily ensuring your road safety. We have a double lane here at our premises in Solihull so we are able to carry out more MOT's per day then other Centres of our kind. You can book quickly and easily online or call us and we'll make your booking personally. Our one man automated lanes, which are checked and configured regularly will test your car properly and within the current set guidelines. Your car is safe with us. Our team knows what they're doing, and they've got a vast array of experience to draw upon. You can trust us. We pride ourselves on our high ethical standards. We'll never carry out unnecessary works, and everything we do will be 100% transparent. Your car is guaranteed. All the work we carry out comes with a two year guarantee, eliminating your risk and giving you peace of mind. Locals love us. We're a local business, and we care about the community. We're proud to be serving the Solihull and Shirley area. An MOT tester you can trust. We want to rectify any problems for you quickly and will always look for the most cost - effective way of achieving this without compromising your safety. Parts guaranteed. All of our work is guaranteed, and we offer an in-house parts and labour guarantee on all of our work for a period of 2 years for your added reassurance.